They join the likes of Rag'n'Bone Man, The Amazons and Nathaniel Rateliff & The Night Sweats for the charity gigs. 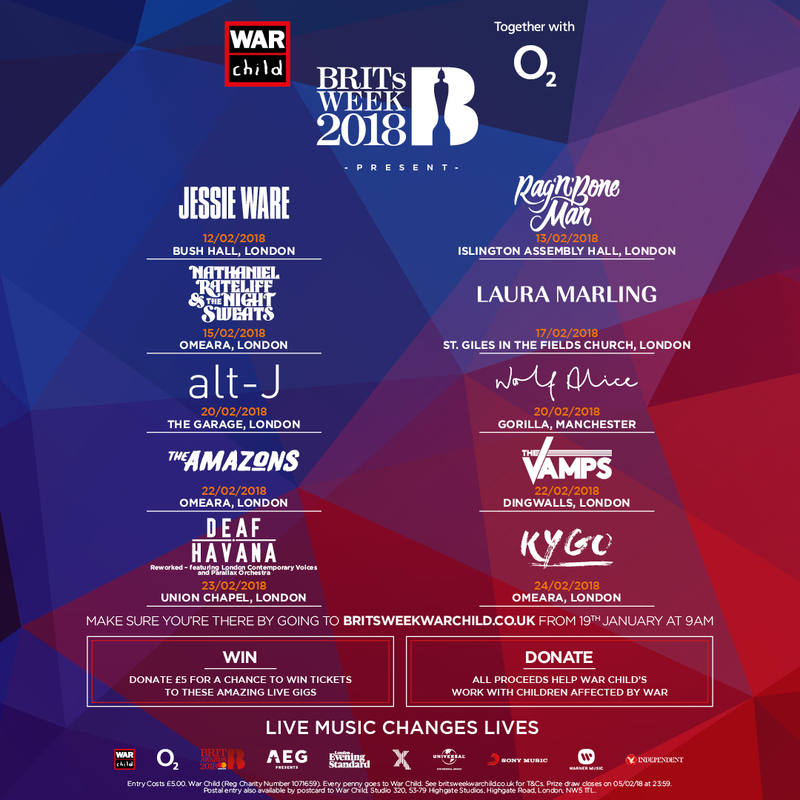 Wolf Alice are among the acts confirmed to play exclusive shows for War Child BRITs Week Together with O2. The Don't Delete The Kisses rockers join a star-studded line-up for special gigs held in the lead up to and after the BRIT Awards to celebrate some of the best of British music. Also set to play the gigs, which raise awareness for children whose lives have been torn apart by war, are 2017 BRITs Critics' Choice Awards winner Rag'n'Bone man, Alt-J, The Amazons, Nathaniel Rateliff & The Night Sweats, Laura Marling and more. Ticket prize draw opens and tickets go on sale at 9.00am on 19 Friday January at www.britsweekwarchild.co.uk. A limited number of tickets for some of the shows will be available to buy exclusively to O2 customers via PriorityTickets from 9am on Wednesday 17 January. Geoff Taylor, Chief Executive BPI & BRIT Awards, says: “BRITs Week is one of my favourite times of the year, when an eclectic mix of brilliantly talented artists come together in the exciting run up to the BRIT Awards to raise money and awareness for children whose lives are shattered by war, and at the same time celebrate the wonderful diversity of British music. Liana Mellotte, Head of Music, Entertainment & Development at War Child says: “This year War Child turns 25 and has helped hundreds of thousands of children cope with the devastating effects of war. Since our first music fundraiser, it’s amazing and very humbling for us to be working with some of the world’s best music talent a quarter of a century later. It’s testament to the musicians who generously donate their time and talent to stand up for the rights of children in the most horrendous circumstances. Every year, we’re overwhelmed by the support of those musicians, their fans and our partners O2 who make this such a special time for War Child”.